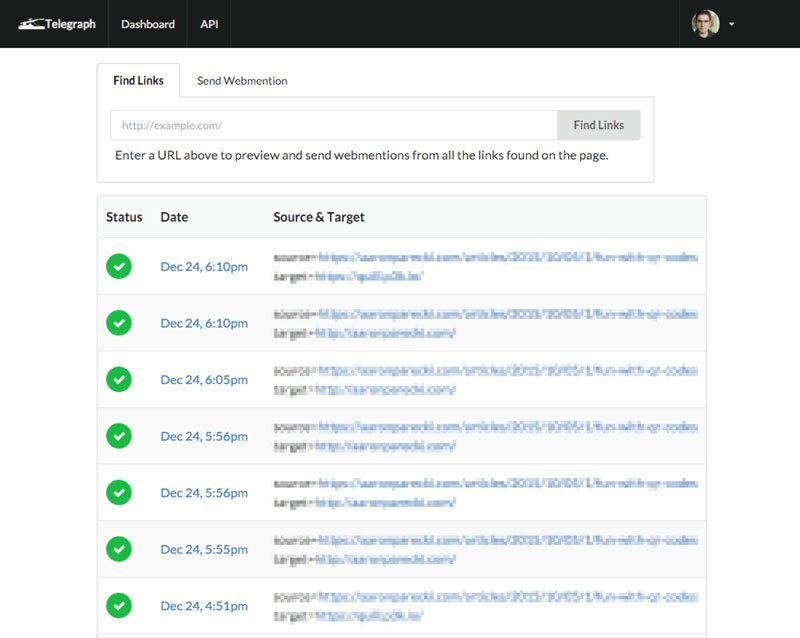 Instead of messing with the details of sending webmentions yourself, we have a simple API that will handle endpoint discovery, gracefully handle failures and retries, and will let you know whether a webmention was successfully sent. All you have to do is tell us the page you want to send the webmention to and we'll take it from there. Sign in to quickly send webmentions from the Dashboard, and see the status of your previously sent webmentions. The status of each webmention can be viewed individually, so you can tell whether it worked or how it failed. Let Telegraph send webmentions for you. With a simple API, Telegraph will handle sending webmentions to other websites. Let us handle webmention endpoint discovery and handling failures. With a simple web hook, Telegraph will notify your site when a webmention was successfully sent or if an error occurred.